Hearing the word fluoride, do you instantly think of the dentist and healthy teeth? According to the American Dental Association (ADA), fluoride is often coined as nature’s cavity fighter because it is a naturally occurring mineral, which helps prevent cavities. Fluoride is attributed with making the outer surface of teeth (enamel) more resistant to the acid that causes tooth decay. 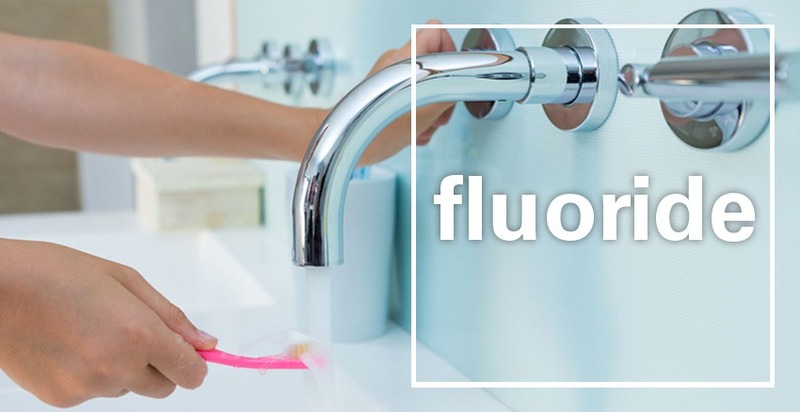 For the past 70 years fluoride has been added to public water supplies to bring it to a level that has been determined to prevent tooth decay. Per the ADA, community water fluoridation is like drinking milk fortified with Vitamin D, and almost 75% of the U.S. population is part of a fluoridated community water system. The Center for Disease Control and Prevention has deemed community water fluoridation one of the great public health achievements of the 20th century. There are, however, always two sides to every story. Water fluoridation means adding industrial-grade fluoride chemicals to water to prevent tooth decay. The United States has more people drinking fluoridated water than the entire world combined. However, data from the World Health Organization (WHO) shows that there is no discernible difference in tooth decay between fluoridated versus non-fluoridated nations. It is clearly visible that fluoridating water practices are no longer serving us. Water treatment processes are implemented to treat water specifically, not the person ingesting it. The Food & Drug Administration (FDA) states that fluoride is a drug, not a nutrient, when it is used to prevent a disease, like tooth decay. Fluoridating water, therefore, is a form of medication supposedly being used to prevent tooth decay. “Fluoridation goes against all principles of pharmacology. It’s obsolete.” — Dr. Arvid Carlsson, Nobel Laureate in Medicine/Physiology. Another question that comes up with fluoridating water – what is the safe amount of fluoride to ingest and where does that amount cross the line into unsafe territory? Think about who drinks water. Everyone! From infants to the elderly and everyone in between (and our animals) need water to sustain life. No one and no living thing can be without water. Unfortunately, there is no way to control or track how much fluoride one is consuming through fluoridated water, not to mention other products that contain fluoride like highly processed foods, which most often are processed with fluoridated water. Also, what is in some drinking water has long been used in rodenticides and pesticides to kill rats and insects. Do you see the connection? Fluoride-based pesticides that are used on grains and fed to animals, which is stored in their bones, fat, and skin, may also drink fluoridated water. As well, fluoridated water may be used in growing and processing food. Did you have tea this morning? Fluoride-based pesticides accumulate in tea leaves. So, how much fluoride are we ingesting? To learn about potential fluoride toxicity visit… http://fluoridealert.org/studies/acute02/. The Center for Disease Control’s Oral Health Division now acknowledges that the main benefit of fluoride is derived from topical contact with teeth, such as with brushing, not ingestion. So why continue to fluoridate our water? Is there really a need or health benefit from drinking fluoride? Let’s back up a few paragraphs and address the term “industrial-grade fluoride chemicals”. The fluoride chemicals used to fluoridate drinking water are: Fluorosilicic Acid, Sodium Fluorosilicate, and Sodium Fluoride. Unlike the fluoride compounds found in toothpaste or supplements, fluoridation chemicals are not pharmaceutical grade quality. They are, instead, unpurified industrial by-products that are collected in the air pollution control systems of certain industries, such as the phosphate fertilizer industry. Also, China has now entered the arena of providing fluoride chemicals to U.S. water plants. Keep in mind their chemical quality control is even more lax. In short, fluoride is so much more than healthy teeth. To read more… http://fluoridealert.org/issues/water/fluoridation-chemicals/. We will continue from here in November, with Part 2, as there is much information to share. Keeping the community healthfully hydrated is our business, and so is raising awareness in the process. We have been committed to doing this for 72 years!